It wasn’t the only reason Preston chose to leave his home in Denver, Colorado, at the age of 64. Perhaps the most important was Thailand’s reputation for a low cost of living. Known as the Rose of the North, Chiang Mai is Thailand’s third-largest city. It’s a favorite spot for both full-time expats and for people looking for sun and relaxation for a few months each year. 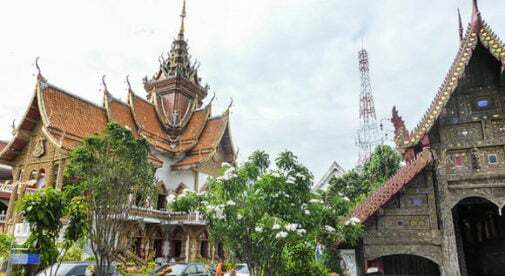 Temperatures average from the low 70s F to the mid-80s F.
Chiang Mai still retains much of its historical ambience—stunning, gold-gilded temples, narrow winding back streets, and food markets stocking weird and wonderful spices and vegetables. It’s also home to upmarket cafés and restaurants that serve foods both familiar and foreign. With all this at your fingertips, you have a city that lets you live an interesting and comfortable lifestyle. When Preston first arrived in Chiang Mai, he stayed at a guesthouse. As much as he liked the place and the people, he wanted somewhere with a pool and a gym, so he moved into a hotel. But that’s not how he thinks of it. “For me, the room is a condo. The only difference is that it doesn’t have a kitchen, so I suppose it’s a studio apartment.” It costs him $280 a month, rising to about $300 when you add in electricity and water. By comparison, a studio apartment in a decent part of Denver would cost about $1,000 a month, not including utilities. “I spend about $300 [a month] on food. I eat out two or three meals a day. I like local food; a spicy noodle soup with either chicken or pork is one of my favorites. I can get a bowl of that for around $1.10 that makes a good light lunch. But I have a hard time giving up my Western breakfast of toast and eggs, and every once in a while I’ll have a burger. There’s an American-run restaurant I go to called Butter is Better, which serves authentic American diner food. You can get things like borscht for about $2.70 and a really good chicken pot pie for $5. A meal would run about $8, but you would easily pay twice that for a similar meal in the U.S.
Apart from the tinge of exoticism, the affordable lifestyle, and plenty of activities, there’s something else that appeals to Preston about his new life overseas. Simply enter your email address below to sign up for IL’s free daily postcards and we’ll also send you a Free Thailand Report – Thailand: Live Like Royalty in the Land of Smiles.